I’m going to start with this–I just finished this book a little less than an hour ago, and I can already say that it has changed my life. Angie Thomas’s book about 16-year-old Starr Carter left me speechless and crying for so many reasons, and I’m not sure I can even explain why adequately. Starr herself is written perfectly. She’s a high school junior who loves basketball, used to have a massive crush on a Jonas brother, and collects sneakers. She also loves her family, even when they embarrass or frustrate her, is a good student at the private school she attends with almost exclusively rich, white kids (one of whom is her boyfriend), and helps at her dad’s community grocery store when she can. However, her life is very different from the ones her friends at school live. Starr is the only black girl in her junior class, lives in a poor black neighborhood that sees more than its fair share of gang violence, is the daughter of an ex-gang member who served time in prison, and saw one of her two best friends killed in a drive-by when she was ten years old. And on the night she is with her other childhood best friend, Khalil, when he is shot in the back by a police officer, despite being unarmed and not doing anything to provoke the officer in any way, she finds herself in the middle of all the fallout from the shooting while still grieving Khalil’s death. I’m more than a little ashamed to admit that I’m a privileged white woman in a tiny, primarily white, community who has never really even given a ton of thought to the Black Lives Matter movement. I have heard the news, and I felt a piece of the injustice of it all, but prior to reading The Hate U Give, I had never really tried to imagine what the black community really felt. I’m still a privileged white woman in a tiny, primarily white community, which means that I will never really be able to understand what the black community feels, but I’m trying, and I’m trying so much harder than I ever did before. As far as a review, I’m not sure what to say. This is young adult fiction, so I knew it wouldn’t be the level of writing to which I’m accustomed. However, Angie Thomas still did an excellent job of creating living, breathing characters and thought-provoking text that made me grab my highlighter many times as I read. The teenagers spoke exactly as teenagers do without coming across as cliché at all, and I usually find that adult young adult writers either try TOO hard to make teenage characters sound like teenagers OR they make them sound entirely too grown up (I’m looking at you in The Fault in Our Stars, John Green. Yeah. I said it.). Thomas, however, nailed it. When I finished this book a little while ago, I sobbed like I haven’t at the end of a book in a LONG time. I sobbed for Khalil and his community, but more so for the list of real names at the end (that’s not a spoiler…promise). There were plenty of moments in the book that made me chuckle a little that helped break up the heaviness of the book (especially when DeVante, Seven, and Starr start making fun of white people, because, let’s be honest, everything they said was true), but the weight of the truth this book made me see hit me like a ton of bricks. I’m white. I never have to worry about one of my sons being killed by the police simply for their skin color. And I will never understand that particular reality. Instead, I have been living inside my safe little bubble where I believed that ALL police officers are good and ALL police officers are just trying to do their jobs and racism is really not THAT bad in our country. I never allowed myself to see that SOME police officers are downright racist, and SOME police officers are scared of young, black men simply because they are young, black men, and people of color ARE treated differently, and ANY racism IS that bad. The Hate U Give started changing all that. It enabled me to step into the shoes of a 16-year-old black girl who saw her childhood best friend shot simply because he was young, black, and in a neighborhood with a bad reputation. It also enabled me to see that the lives behind the news headlines are so much more complicated than I am often led to believe, but Angie Thomas never did any of that in a way that placed all the blame on the police. The blame was definitely there, but Starr also acknowledges that there are still a lot of good police officers who don’t agree with the actions of their colleagues, and although she helped me to understand the sentiment behind rioting, she also acknowledges the damage done by rioting is usually to her own community only. And underneath it all, Angie Thomas makes it clear that Starr’s community had its own problems from within that were not the fault of the police at all. 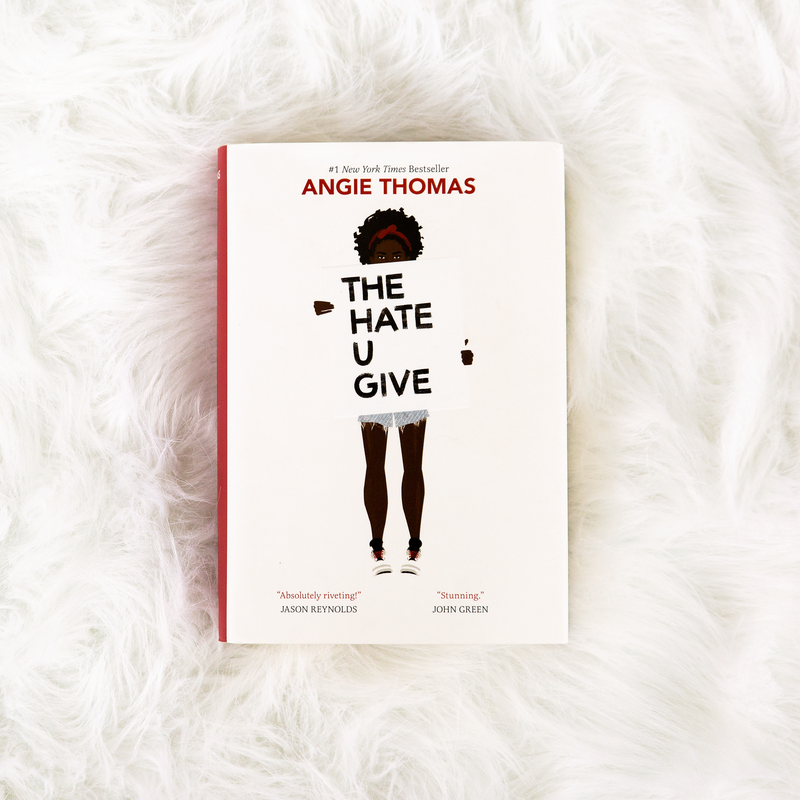 Instead of placing blame on ANYONE, Angie Thomas is making readers see that there are definitely two sides to every story, and for most of us, we have only REALLY heard one of them. Posted in FictionTagged Angie Thomas, book review, Fiction, The Hate U Give, Young AdultBookmark the permalink.